Free Shipping On All Orders of $100or More! 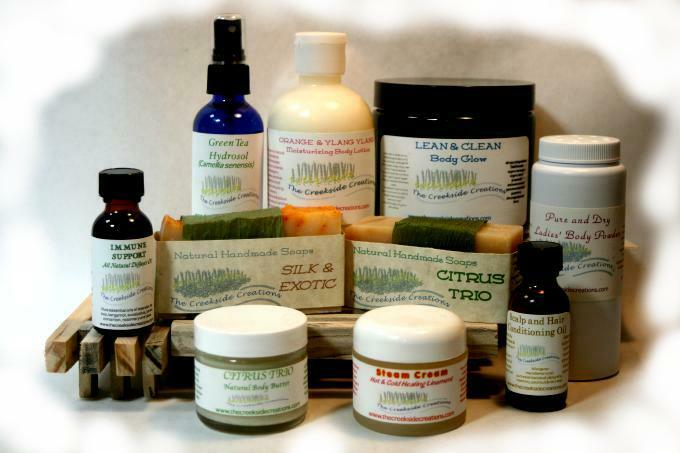 The Creekside Creations is committed to using nature's offerings to create products that heal the body, mind and spirit. Our products include natural soaps, body scrubs, moisturizers, skin protection products, lip balm, hair care products, massage oils, aromatherapy oils, ointments for muscle pain and congestion, pet products and non-toxic household cleaners. Caryn Summers, R.N., is a Wildcrafter and lover of the natural way, and work in a cottage kitchen in Reno Nevada. Caryn's motto, Created from the Earth, Powered by the Sun, shows her commitment to sustainability and her love of nature. Caryn blends her knowledge of botanicals, health, and science with a unique talent to use garden herbs, wild botanicals, pure essential oils and other organic ingredients to create pure and healthy products.